Director Antonio Racioppi's historical gangster movie of the the 70s obviously lacks the sweep and grandeur of Godfather II, losing or ignoring altogether everything that made the Coppola film such a masterpiece: good acting, mesmerizing storyline, and the absence of melodrama. But we do get abrupt and jarring setpieces of gore, plus one of the single best uses of an Italian cinema dummy to date. If the crushed human form trampled beneath horses' hooves and carriage here were an actual Italian stuntman, it would be unsurprising. Bravo. 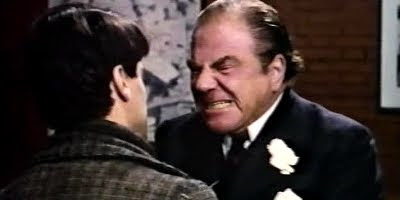 Lionel Stander plays Commissioner Petrosino, this a role originated by Ernest Borgnine in Pay Or Die, who confronts the burgeoning Italian mob in turn of the century America. The protagonist, an ineffectual Michele Placido has his own struggles with identity, and crime, and supporting his poor wife, yet the young couple are constricted by so many ridiculous love scenes, one welcomes the absurdly violent gore inserts that interrupt all the impassioned embraces and swelling strings. Stander's somewhat compelling tantrums and voice don't bring the film back to reality often enough. Other movie highlight would have to be an uncredited yet stunningly beautiful Giuseppe Castellano beating Placido while taunting him with "damn d-go!". A must-see for dummy enthusiasts.